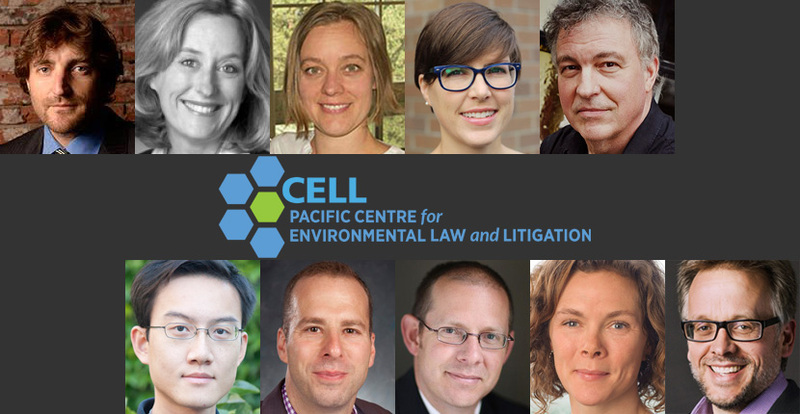 CELL is a new kind of legal non-profit on the Canadian environmental law landscape. Our goal is to train and mentor tomorrow’s environmental defenders in the litigation skills they will need to advocate effectively for the public interest. They will acquire these skills by working on strategically selected and closely supervised public interest environmental cases that promote access to justice and the rule of law. To oversee and run CELL’s operations, a talented and committed team has been assembled from the worlds of litigation practice and academe. Our board and staff will work closely together to deliver our innovative litigation and education programs. President of the Board — Catherine Boies Parker, Q.C. was an associate counsel at Farris Vaughan Wills & Murphy LLP before she joined Underhill, Boies Parker, Gage & Latimer LLP (now Arvay Finlay LLP) as a partner in 2017. She graduated from UVic Law in 1994, where she received the Law Society Gold Medal and Prize. Catherine was called to the Bar of the Law Society of British Columbia in 1998. Her areas of practice include constitutional, administrative, privacy, environmental, aboriginal and labour and employment law, as well as general civil litigation. Catherine has appeared at all levels of court and before numerous tribunals, and has acted as an adjudicator for the Office of the Information and Privacy Commissioner for British Columbia. She has been an instructor at the University of Victoria and is a frequent guest lecturer on topics such as constitutional law, privacy law and civil liberties. She has served as director and chair of various advocacy groups for child abuse prevention. Catherine was awarded the 2008 Contribution to the Law Award from the Victoria Bar Association in recognition of her work on a case involving the Charter rights of Victoria’s homeless. In 2009, she received a Human Rights Honours Award, sponsored by the Vancouver Island Human Rights Institute and presented by the Honourable Stephen L. Point. Vice President of the Board — Mark G. Underhill is a partner at Underhill, Boies Parker, Gage & Latimer LLP (now Arvay Finlay LLP). He graduated from UVic Law in 1995 and was called to the Bar of the Law Society of British Columbia in 1996. He practised with a leading litigation boutique for ten years before establishing his own firm in 2005. His areas of interest include administrative, environmental, aboriginal and constitutional law. He also maintains a broad general civil litigation practice. Mark has appeared at all levels of court, including as lead counsel for the plaintiffs in Canadian Federation of Students v. Greater Vancouver Transportation Authority in the Supreme Court of Canada. He has taught environmental law at the University of Victoria and is a regular speaker at legal educational conferences in his practice areas. Among other community activities, Mark is the former President and chair of the board of directors of the West Coast Environmental Law Association. Mark has been selected by his peers to be included in Best Lawyers in Canada in the areas of aboriginal law, administrative and public law, and environmental law. Treasurer — Maegen Giltrow is a partner at Ratliff & Company LLP. She graduated from the Dalhousie Faculty of Law in 2003. Upon her call to the BC Bar in 2005, she practiced for several years exclusively in the area of aboriginal litigation, representing First Nations in commercial disputes, fiduciary duty claims, reserve based claims, tort claims, consultation and accommodation and aboriginal rights and title claims. More recently, her practice has expanded to include advising and representing local governments, in particular with respect to First Nations, resource development and environmental protection issues. Maegen has considerable experience in governance matters, having helped develop legislation leading to self-governance under treaty, and one of British Columbia’s first indigenous adjudicative tribunals. She has also worked on law reform and governance projects with the International Centre for Criminal Law Reform and Criminal Justice Policy at UBC. While in law school, Maegen was a top scholar, maintaining a Nova Scotia Law Foundation scholarship award throughout her studies. Upon graduating she clerked for Justices Rowles and Southin at the B.C. Court of Appeal. Secretary — Jason Gratl founded and practices at Gratl and Company in Vancouver. He received his law degree at the University of Toronto Law and was called to the bar in BC in 2001. Before law school, he obtained an M.A. in philosophy from the University of Waterloo. He is an experienced trial and appellate lawyer regularly appearing in all levels of Court. Jason was counsel in a number of leading Supreme Court of Canada matters including on Charkaoui v. Minister of Citizenship and Immigration, SWUAV v. Attorney General of Canada, Carter v. Canada (Attorney General), and R. v. Smith. He served as Independent Counsel at the Missing Women Commission of Inquiry representing the interests and perspectives of affected individuals and organizations within the Downtown Eastside. From 2005 to 2008 he was President of the British Columbia Civil Liberties Association. He has also served on the Board of Directors of Pivot Legal Society, the East End Food Coop, Frank Paul Society and Radix Theatre Society. Since 2005, Jason has been appointed as Adjunct Professor at the University of British Columbia, where he teaches a seminar in Public Law. In 2009, the Canadian Association of Journalists presented Jason with the President’s Award for his work in defence of free expression. In 2014, he was nominated for the Canadian Lawyer Magazine’s Top 25 Most Influential Lawyers. Director at Large — Reidar Mogerman is a partner at Camp Fiorante Matthews Mogerman. He was called to the bar in 1997. Reidar’s practice is currently focused on class actions, product liability and aviation law. Reidar has worked as counsel and as an advisor on major public and private law litigation in all levels of court in British Columbia. He also has acted as counsel before the Alberta Court of Queens Bench, the Federal Court of Canada, and the Supreme Court of Canada. Reidar has been involved in precedent setting Supreme Court of Canada cases in the areas of aboriginal law (the Haida, Taku, Osoyoos, and Okanagan cases), product liability (A.G. British Columbia v. Imperial Tobacco Canada and others), constitutional law (Law Society of British Columbia v. Mangat), and executive privilege (Babcock v. A.G. Canada). He also has significant exposure to cases involving public and private international law, trusts and pensions, administrative law, fraud, professional liability, and environmental law. He is presently involved in a number of multi-jurisdictional competition law class actions. Away from work, Reidar skis, mountain bikes and surfs. Director at Large — Jocelyn Stacey is an Assistant Professor at the Peter A. Allard School of Law, University of British Columbia. Her research focuses on Canadian environmental and administrative law. She has a doctorate in law from McGill University, an LLM from Yale Law School, and an LLB from the University of Calgary. She was called to the Bar in Ontario in 2010. Her research focuses on the relationship between the rule of law and environmental issues. Her current work explores the potential implications of understanding environmental issues from the perspective of an ongoing emergency. A profile of her current work can be found on the Research Portal. Jocelyn has been the recipient of numerous academic awards including a SSHRC Joseph-Armand Bombardier Canada Graduate Scholarship for her doctoral work. Prior to her graduate work, Jocelyn clerked for the Honorable Justice Marshall Rothstein at the Supreme Court of Canada. Director at Large — Jason MacLean is an Assistant Professor University of Saskatchewan College of Law. Before his current appointment, he was an Assistant Professor at the Bora Laskin Faculty of Law at Lakehead University. His research focuses on climate change law and policy, sustainability processes and pathways, and transnational corporate law (his research is available on SSRN). Currently a doctoral candidate in law at the University of Alberta, he has a BA from St. Francis Xavier University, an MA from the University of Toronto, and BCL and LLB degrees from McGill University. Jason began his career as a litigator, first at Shearman & Sterling LLP in New York, and then at Osler, Hoskin & Harcourt LLP in Toronto, and also clerked at the Supreme Court of Canada for Madam Justice Marie Deschamps. He is called to the bar in New York and Ontario, and has appeared at all levels of court in Canada, including the Supreme Court of Canada, the Federal Court of Appeal, and the Ontario Court of Appeal. Director at Large — Charis Kamphuis is an Assistant Professor at the Thompson Rivers University Faculty of Law. She is also a doctoral candidate at Osgoode Hall Law School and was called to the Bar of Ontario in 2009 after clerking at the Federal Court of Appeal of Canada. Her research transverses multiple fields of law and policy that touch on resource extraction, Indigenous rights, activism & human rights defenders, corporate accountability and home-state extra-territorial responsibility. She has published in peer-reviewed journals across Canada and internationally (SSRN). She is a co-founder of the Justice and Corporate Accountability Project (JCAP), a not-for-profit organization that provides legal support to communities in Latin America, Africa and Canada adversely affected by resource extraction. Chris Tollefson is the founding Executive Director of CELL and a Professor of Law at the University of Victoria. He has degrees from Queen’s, University of Victoria and Osgoode Hall Law School, and clerked at the BC Court of Appeal for Justices Lambert and Macdonald. Chris combines teaching and research on environmental issues with counsel work for various public interest environmental clients. This counsel work has included appearances before all levels of court, including the Supreme Court of Canada, and various environmental regulatory boards and tribunals. He was counsel to BC Nature and Nature Canada during both the Enbridge Northern Gateway and Kinder Morgan Trans Mountain pipeline hearing processes. His publications cover a range of environmental and natural resource topics including environmental assessment, eco-certification, and access to justice. He is co-author (with Meinhard Doelle) of a leading environmental law textbook. Chris is a former President of Ecojustice and founding executive director of the UVic Environmental Law Centre. He has won various awards for his teaching and research, and in 2014 was the recipient of Nature Canada’s Conservation Partner Award for his work leading their legal team during the Northern Gateway pipeline hearings. Anthony Ho is a litigation associate at the Pacific Centre for Environmental Law and Litigation. He received his J.D. from the University of Victoria in 2014, and was called to the British Columbia bar in May 2015. His areas of practice in public interest environmental law has included environmental assessments, regulatory hearings, and judicial reviews. He has appeared before the Enbridge Northern Gateway Joint Review Panel, the NEB in its hearing into the Trans Mountain Expansion Project, the BC Environmental Appeal Board, the Federal Court of Appeal, and the BC Supreme Court. He also holds a Master of Public Administration (UVic ’14), a B.Sc. in environmental sciences (UBC ’10), and a B.A. in political science (UBC ’10). Jeffrey M. McEown is a retired litigator who for over 30 years was a Senior Partner in medium and large downtown Toronto law firms where he specialized in Civil Litigation and Charity Law. During his years in private practice, he was privileged to represent: several Federal Government departments; Crown Agencies; Boards of Education; The Law Society of Upper Canada; Lloyd’s of London; and numerous other institutional and individual clients appearing as senior counsel in the Supreme Court of Canada, all levels of the Federal and Ontario Courts, and before numerous administrative tribunals. He also has extensive mediation and arbitration experience. His teaching experience includes being the Downtown Supervisor of students in the Osgoode Hall clinical training programme, an instructor in the Ontario Bar Admissions Course, speaker at Canadian Bar and Ontario Bar conferences, as well as numerous other privately run educational programmes. He also has a wealth of professional and volunteer work experience in the not-for-profit sector. He and his wife now reside in Victoria. As a CELL Mentor-at-Law, Mr. McEown acts as a mentor to law students who participate in CELL’s experiential learning program.